London Underground commuters are facing an increased threat of industrial action in separate disputes over pay and jobs. The Rail, Maritime and Transport (RMT) union has already rejected a pay offer but is now embroiled in a new row over cuts. The union rejected a 2.5% pay offer last month and is now preparing two separate ballots for industrial action. Transport for London (TfL) said it "remained available" for discussions. RMT's general secretary Mick Cash said TfL were "hammering down on pay, staffing levels, safety and working conditions". He added: "We are now in dispute with London Underground on a number of fronts and are mobilising an industrial and political response that will turn the tide on these ill-conceived attacks." 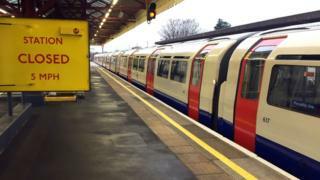 Other Tube unions, including the Transport Salaried Staffs Association, have also rejected the pay offer. TfL said that in the next three years it had to "reduce operating costs" and would consult with staff and trade unions before carrying out any changes. A spokesman added: "None of this will compromise the safety of customers or staff, which will always remain our top priority. "We remain available for discussions with the RMT." At least 30 people are reported killed and 200 injured in six explosions in several cities.